Broken families and ruined careers. Drug abuse, incarceration, and heart attacks. These are the extreme, life-shattering impacts of excessive anger. It’s devastating your clients, destroying their families, and putting their health and lives at risk. Some clients fight their anger, attempting to bury it deep inside. Others express it outwardly to ruinous results. Most aren’t ready to make a change in their life, but have been forced to do so by their partner, their employer, or the court system. Reluctant to give up the feelings of power and righteousness generated by their fury, your best efforts are stymied by their unwillingness to deal with the core problems their anger masks. And angry clients can be aggressive in session. It’s all too easy to refer them to another counselor, letting their anger push you away like so many others. 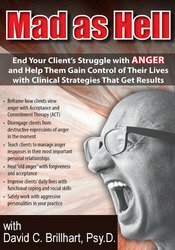 Grounded in Acceptance and Commitment Therapy (ACT), this essential recording will give you the tools you need to teach your clients to accept their anger as a normal emotion, and fundamentally change their destructive reactions. Full of practical applications and detailed instruction, you’ll leave with a playbook to help your clients let go of their emotional struggle with anger and gain control of their lives through values-clarified action. You’ll be able to assess readiness for change, and cultivate transformation with motivational strategies that engage your most reluctant and treatment-resistant clients. Lessons on mindfulness, values clarification, and problem solving are coupled with experiential exercises and targeted techniques to reduce your clients anger responses and empower them to manage their reactions to anger at work, on the road, and in their most important personal relationships. Acceptance and Commitment Therapy (ACT) skills that reduce negative self-talk and self-judgement, and reframe dysfunctional thoughts that lead to excessive angered outbursts. Mindfulness techniques and disengagement strategies that lower the anger response and help clients walk away from conflict and toward valued-living choices. Strategies that help clients define their core values and discover the principles they want to guide their lives. Assertiveness training that teaches clients how to communicate anger constructively and without aggression. Easy-to-implement interventions that heal “old anger” and move clients toward their core values through the power of forgiveness and acceptance. Functional coping and social skills clients can use to improve their daily lives and keep them grounded and in-control while on the road, at work, or at home. In-session tactics that avoid automatic defensiveness and allow you to work effectively and safely with aggressive personalities. Watch this recording and learn to help clients of all ages regulate their responses to excessive anger and provide them with valuable life-affirming alternatives to the dysfunctional and aggressive behaviors that damage their lives! Engage reluctant and treatment-resistant clients with in-session mindfulness-based strategies. Manage responses to dysfunctional thoughts and judgmental beliefs with ACT skills that effectively intervene in these processes. Reduce the body’s anger response with mindfulness training and diaphragmatic breathing techniques that diminish the body’s fight-or-flight response. Teach clients how to communicate anger constructively with assertiveness techniques that increase their emotional vocabulary and enable them to handle conflict without aggression. Conduct a cost-benefit analysis intervention with clients to demonstrate the impact of “old anger” on their lives, and give them the tools to move past it with acceptance. Employ clinical strategies that help avoid automatic defensiveness in clients and allow you to work safely with aggressive personalities. David C. Brillhart, Psy.D., is a licensed psychologist specializing in Acceptance and Commitment Therapy (ACT) and Eye Movement Desensitization and Reprocessing (EMDR). His success using ACT in helping let go of their struggle with anger spans a wide range of individuals and couples, as well as those in forensic and correctional settings. His book chapter on ACT was recently published in Individual Psychological Therapies in Forensic Settings (Davies & Nagi, Eds., 2017). Dr. Brillhart has considerable forensic clinical experience using ACT with high-risk, special needs, and serious persistent mental illness sexual offenders. His research in this area was presented at several national and international conferences including: The 2009 Association for the Treatment of Sexual Abusers (ATSA); the 2010 American Psychological Association (APA); the 2010 Mental Health in Corrections Conference (MHCC); and the 2012, 2013, 2014 ACBS Annual World Conferences, and the 2015 SE ACBS Chapter Conference where he premiered his ACT Behind Bars Forensic and Corrections-based workshop trainings. He has presented and lectured audiences on the use of ACT with these most challenging populations. Dr. Brillhart earned his Masters and Doctorate degrees in Clinical Psychology with Forensic Specialization from The Chicago School of Professional Psychology. Financial: David Brillhart is in private practice. He is the clinical supervisor at Mid-Valley Pain Clinic. Dr. Brillhart receives a speaking honorarium from PESI, Inc. Non-financial: David Brillhart is a member of the American Psychological Association; Oregon Psychological Association; Association for Contextual Behavioral Science; and EMDR International Association.